Availability: Not currently accepting new clients. 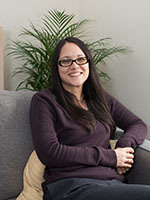 Liz is a Child and Adolescent Psychotherapist trained at the Tavistock Clinic, London. She is a professional member of the Association of Child Psychotherapists. She has worked for the NHS as well as in private practice. Liz works with children of all ages from infancy through to young adults as well as with parents and families. Liz works with a wide range of mental health difficulties and emotional and behavioural issues. She specialises in work with fostered and adopted children and their families. Liz completed her 4 year doctoral level training in a clinic in Surrey. She gained extensive experience working with children and adolescents with various mental health diagnoses including depression, anxiety, self-harm, ADHD, attachment disorder as well as complex emotional, behavioural and relational problems and children on the Autism spectrum. Liz added to her considerable prior experience by offering individual psychotherapy to many fostered/adopted children with a history of abuse and trauma as well as attachment based support to their parents. Liz moved to Hong Kong and worked in private practice there for 3 years. Whilst in Hong Kong, Liz also taught counselling and psychotherapy on masters courses at Hong Kong University, ran an infant observation group and gave various lectures focusing on a psychoanalytic understanding of child psychological development. Liz specialises in offering individual psychoanalytic psychotherapy to children and adolescents up to 25 years old. She offers parent-infant psychotherapy for parents and babies in need of support and family work with under 5s. Liz also offers parent psychotherapy to support parents with issues which may be affecting their parenting. Liz’s psychoanalytic therapeutic orientation means that she takes a non-directive approach within a safe, confidential space to enable the child/adolescent to bring their thoughts and feelings at their own pace for Liz and the child/adolescent to think about together. Children and adolescents are provided with age appropriate toys and art materials to help them communicate. Liz is trained to carefully observe and understand the deeper meaning behind play and communication and help the child/adolescent put into words what may be difficult to express and think about. The aim of therapy is to help the child/adolescent gain insight into themselves which in turn will impact on their behaviour and relationships with others. Liz believes that each child/adolescent is a complex individual and it is her role to tune into how they perceive the world in order to really understand life from their perspective. It is the experience of being understood that is truly therapeutic. Working relationally with the child/adolescent enables them to see how they relate to other people and work through unresolved issues and problems together with their therapist. Psychoanalytic psychotherapy can help a child gain a resilient sense of their identity, build self-esteem and equip them with a robust ability to deal with emotional difficulties which lasts long into adulthood. Liz Fletcher is not accepting new clients for the foreseeable future. To be connected to an available therapist please use the Appointment Enquiry form.